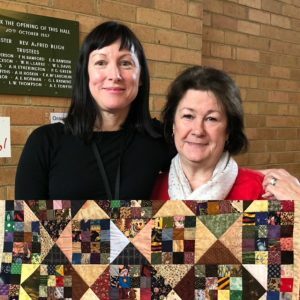 Biggest Morning Tea - The Australian Quilters Association Inc.
Each year the AQA supports the Cancer Council’s “Biggest Morning Tea” event to raise money for cancer research. 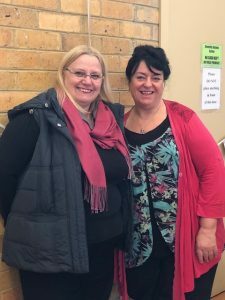 More than seventy AQA members and guests gathered at Surrey Hills Uniting Church Hall, to raise money for the Cancer Council of Victoria. During the day we enjoyed a lovely spread of delicious treats, including, scones, biscuits, slices and fresh fruit. Suzanne Simpson AQA President, welcomed our Guest Speaker – Dr Kara Britt, researcher with Peter MacCallum Cancer Centre. Kara shared her life and work and spoke at length about the progress being made in her field, specifically Breast Cancer. Kara detailed some of the types of treatments being used today and the changes involved in the speed with which research is being applied to current patients. There have been some promising results. Kara also shared her personal experiences and showed tremendous empathy and a real passion for her work. Shirley Lodington (Vice President AQA) left, and Anne Franzi-Ford (Manager Volunteer Services Peter Mac) right. Anne Franzi-Ford, the Manager of Volunteer Services from Peter Mac also attended. Thank you, Kara and Anne, for adding to our day. There was a lot of fun and games as members took part in two patchwork trivia quizzes prepared by Shirley Lodington, and a couple of Birthday games. Attendees worked on patchwork, applique, embroidery knitting and even some bobbin lace making by Kate Potonik. After lunch Tracey Leonard braved the stage and had her hair cut. Two hairdressers attended and there was much fun and laughter. Tracey has not had her hair cut above her shoulders for more than twenty-five years. She had dyed her hair bright pink for the big day. Kaye Hardman was our presenter for this part of the program. The total funds raised came to just over $700.00 Congratulations Tracey! Thank you, Kaye. Cindy and her team provided specially cut packs of Liberty fabric for sale. Today saw the last of these sold. The total raised reached a little over $600.00. Congratulations Cindy and all the girls who helped. Thank you to everyone who came along, contributed, and helped make the day so successful.